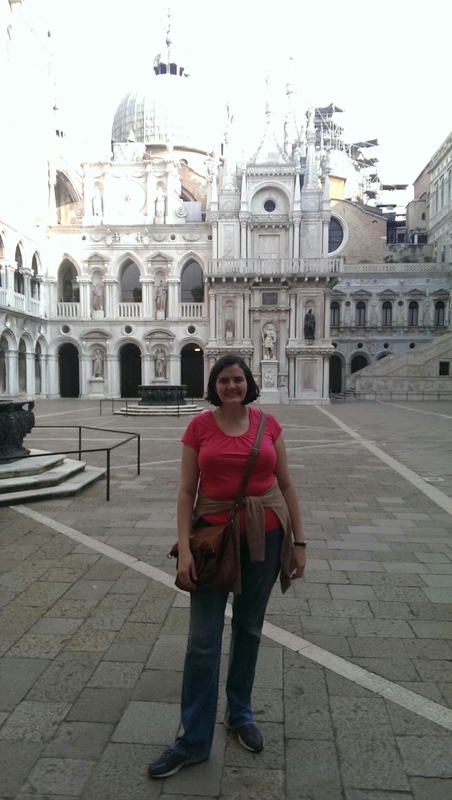 Our train from Venice to Florence didn’t leave until the early evening, so we decided to spend our last day touring two of the city’s most famous sights, the Doge’s Palace and the Basilica de San Marco, which are conveniently side by side. And which you are not allowed to photograph from the inside. Rats! Pro Tourist Tip: 90% of people prefer to sleep in when on vacation. Therefore getting up early usually pays off. 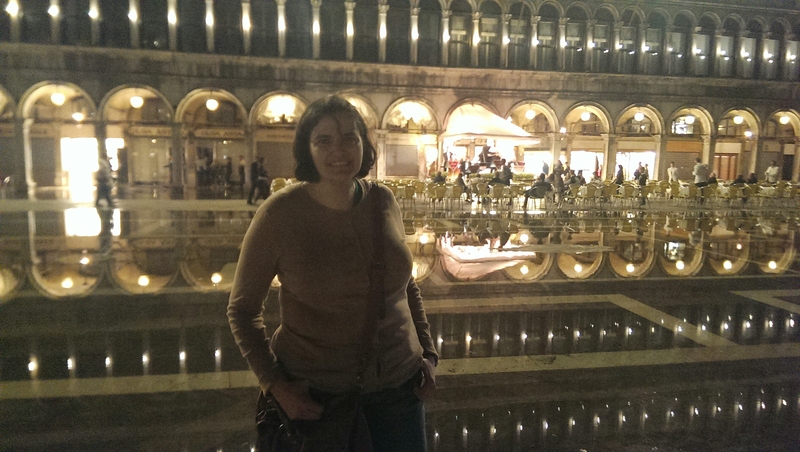 The Plaza de San Marco was relaxing and serene. The morning light coming in off the lagoon reminded me why so many artists painted this place. 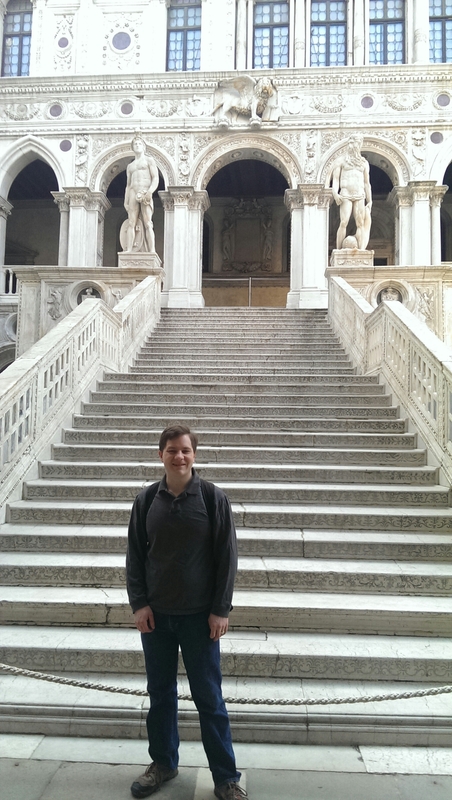 Yes, here are the few exterior shots of the Doge’s Palace we were allowed to take. Our guidebook described the giant statues at the top of the stairs as “Moses and Paul Newman.” In reality, I think it is Neptune and Apollo, but don’t quote me on that. Note one more winged lion at the top of the arch. It’s all about the mascot, baby. See this slot in the mouth of this head carved into the wall? That was where snitching Venetians could secretly accuse their neighbors of crimes. 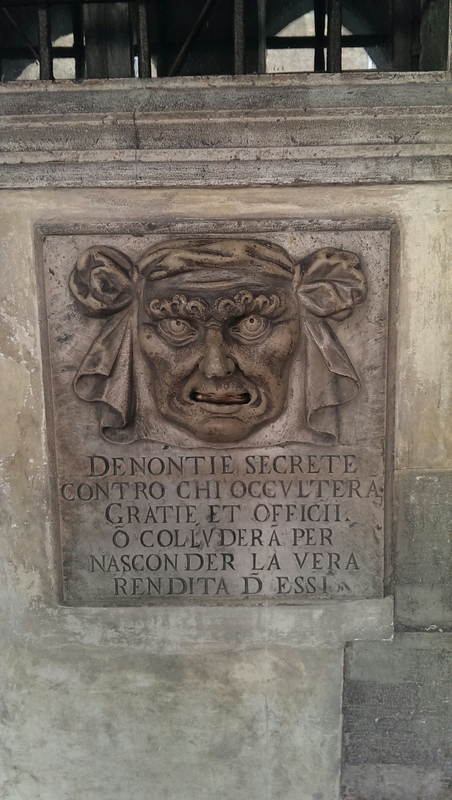 The amount of secret-police espionage and creepiness in old-world Venice was kind of terrifying. 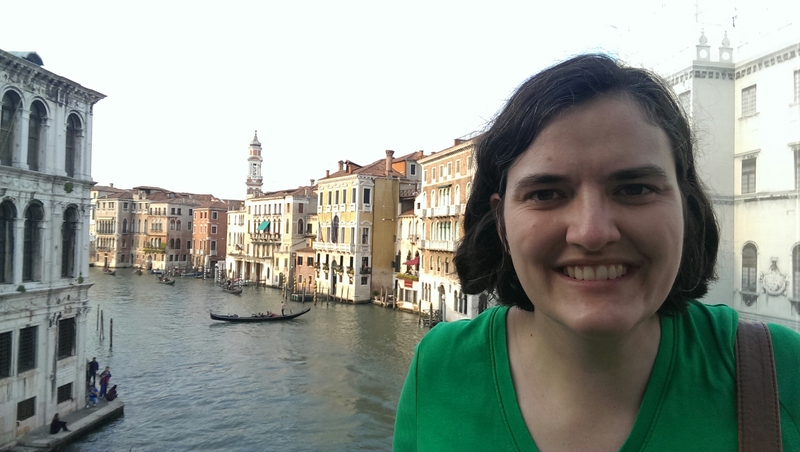 Here’s what I learned: Venice was kind of a democracy, with the Doge being elected out of a select group of landowners (kind of like the House of Burgesses in colonial-era Virginia). There were special cabinets devoted to holding the volumes and volumes of pedigree charts to keep track of whose descendants get to vote and be eligible for the Doge-ship. My favorite feature was the Map Room, with Renaissance-era maps painted all over the walls. Brian and I stared at this one for a long time before we figured out what it was. Go ahead and take a guess, I’ll put the answers below. The land mass on the right is upside-down Southern Asia (note India at the top) and the land mass on the left is the New World, i.e. Mexico. Still not nearly as frightening as the Tower of London. Oh! I forgot to mention! 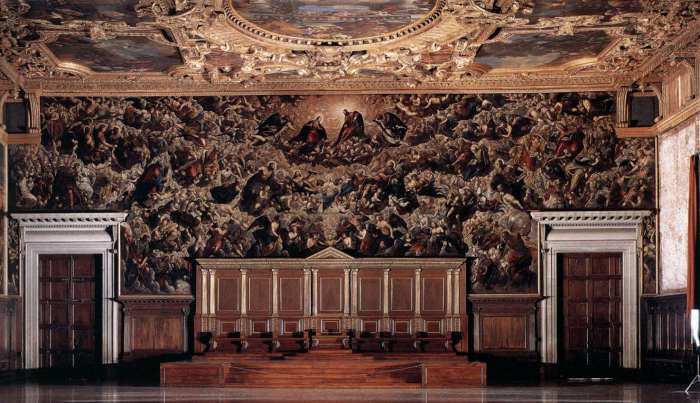 Did you know that this palace also has the world’s largest oil painting? Yes, indeed. Because Tintoretto was a brilliant artist but perhaps just a leetle bit crazy. This is it, a painting of the End of the World, etc. There are over 500 figures in that painting, and they are all life-sized. Kind of dizzifying. Tourist Pro Tip: if you go straight to the church’s bag check-in around the corner, you get a special token that allows you to skip! the! line! 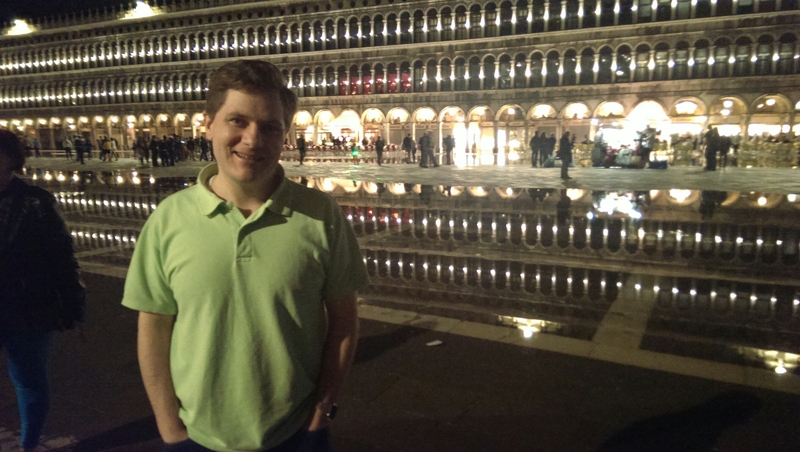 Which was fortunate, since by the time we emerged from the Doge’s Palace, the line stretched across the plaza and almost down to the water. Anyway. 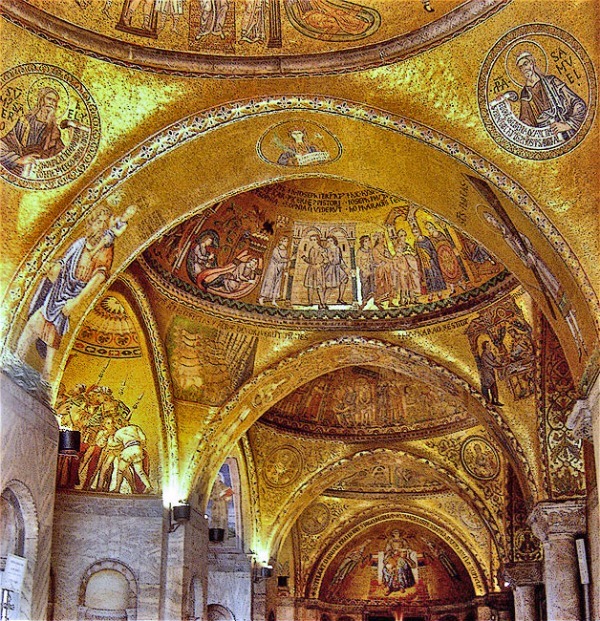 You can see Venice’s long trading history with the Middle East through this cathedral’s Byzantine-inspired architecture. Voila! There you go! I’d say more, but I think it’s kind of obvious that Brian and I didn’t find this cathedral terribly interesting. Beautiful, though. I especially liked the mosaic of St. Christopher carrying the Christ Child on his shoulders (you can see it on the left side of the photo). It’s one of my favorite saint’s legends, having read a retelling of it in The Secret of Green Knowe. 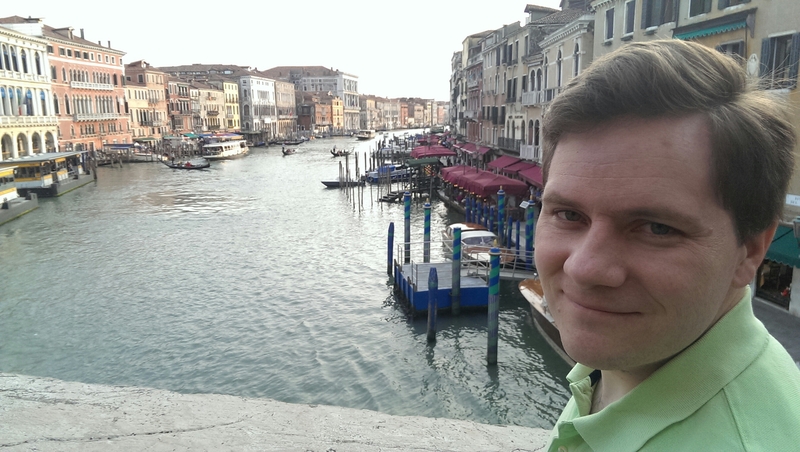 If you look closely, you can see an orchestra performing in the background behind me. There are multiple outdoor cafes on the plaza that do this every night. The cafe behind me has been around forever and served famous people from Lord Byron to Woody Allen. In the day, the plaza was so crowded it made me positively claustrophobic. We avoided it during the day whenever possible. Huh. 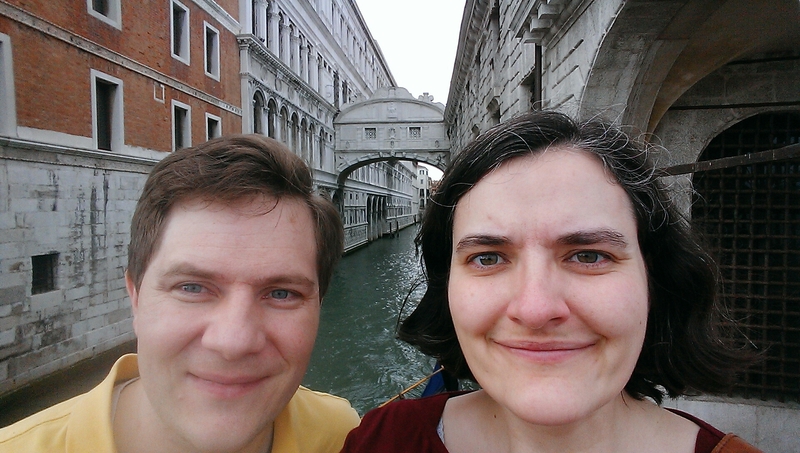 I just realized that Brian and I were both wearing green shirts that day. 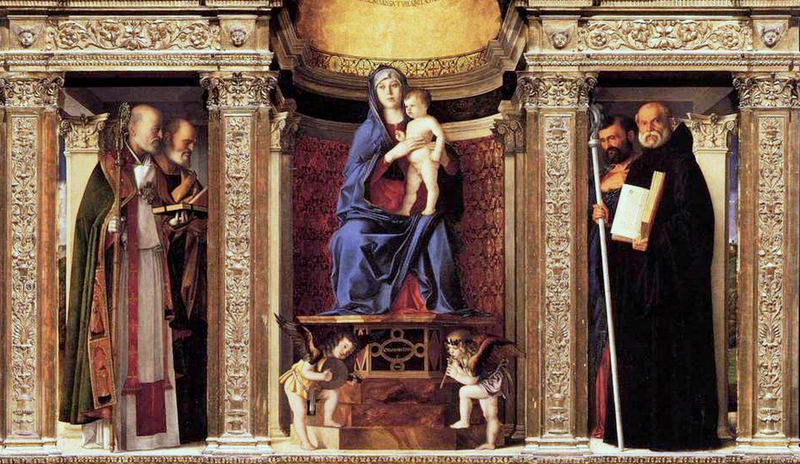 This image really fails to convey exactly how vibrant and three-dimensional the figures look on the triptych. It’s a very dark gothic church, and these little paintings nearly glow. It’s just an impressive feat of craftsmanship. 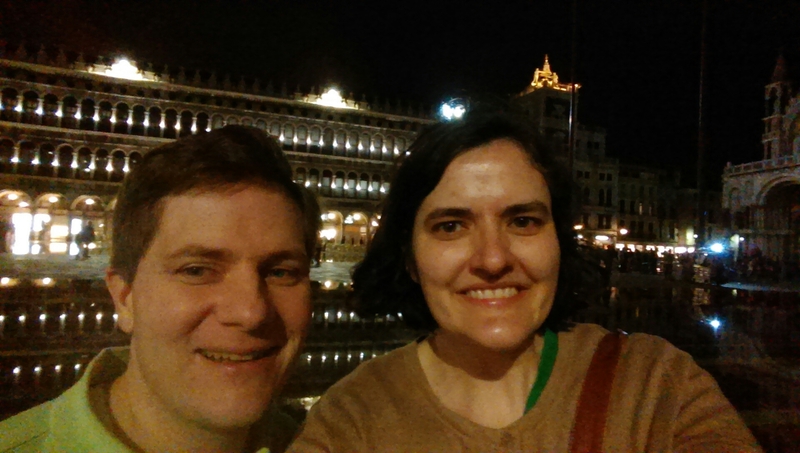 And so, with a hustle back to the hotel for our bags and back to the train station, thus ended our three days in Venice. 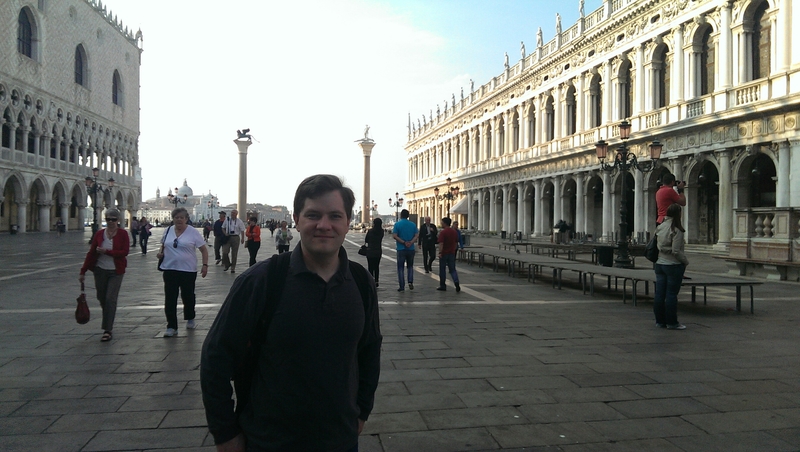 I’ll do one more Venice post to capture all the random little bits that aren’t Major Tourist Places, so stay tuned.